We come to the final chapter in this dramatic moment of natural history. If you've been blissfully unaware and this is your first glance of this story, then please do get up to speed by reading PART 1 and PART 2 before continuing (a cup of coffee would be needed). 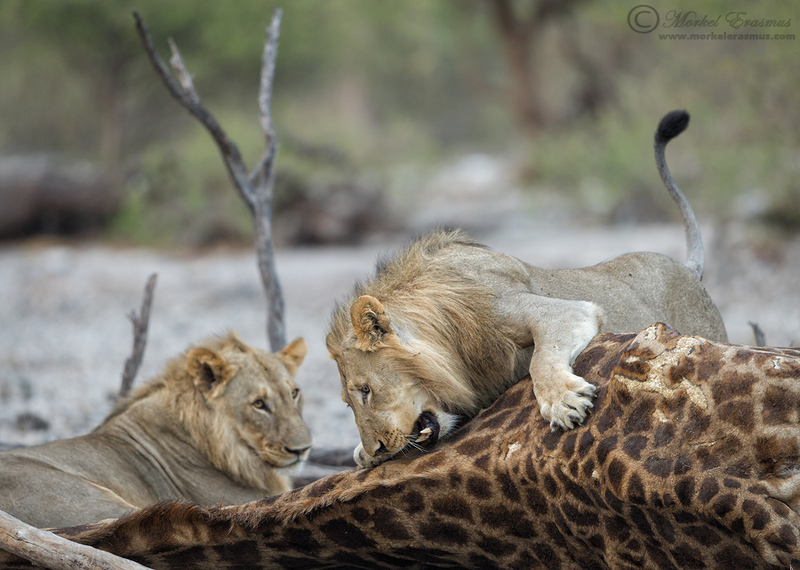 The old bull was clearly feeling the weight of the two male lions gripping his hind legs like steel. He was shuffling and shaking to try and break free from their lethal grip. He was fighting valiantly, even though he was intensely tired and worn down. And then, a mere 30 seconds after the first lion got a proper grip, he tumbled to the ground, a fallen giant, a defeated warrior, a vanquished fortress. I was taken aback - I had really thought that more of the pride members would be needed and they would be jumping into the fray by now. Not even the third young male was getting involved - and the rest of the pride was not even on the scene as I was viewing it. Yet, no sooner did he fall, and the pride suddenly appeared (they must have been waiting patiently in the bushes, all non-committal for some reason). 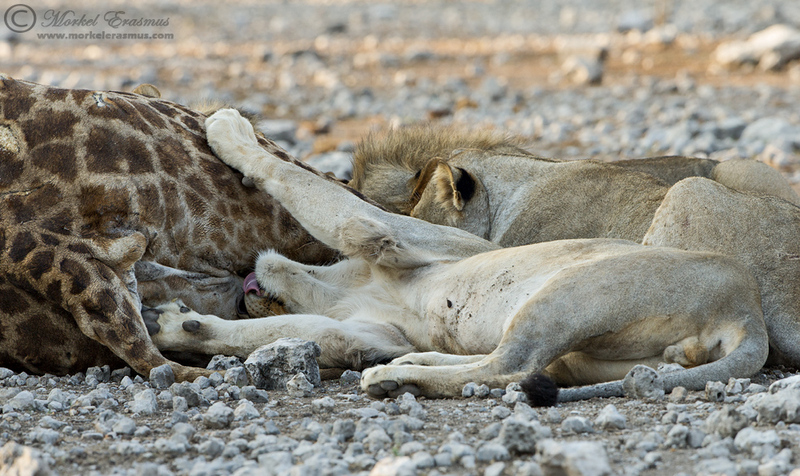 The third male now made himself useful by going for the jugular of the giraffe immediately. It was over in a matter of a minute. The old guy didn't even struggle upon hitting the ground - relenting to his fate as it were. And so, suddenly it was very quiet. Not just in front of me at the scene of the crime, but also in my head and heart. No more frantic camera setting decisions. No more wondering if this was actually going to play out to the end. Just a reverence and awe for the raw power of nature, the natural struggle and fight for survival that these creatures endure day after day - the dance of life and death. Sometimes, the prey has the best moves and gets away, leaving the predator hungry and desperate. At other times, the predator outmaneuvers the prey and sustenance is obtained by the sacrifice of another. Yet every time, it is something that leaves us reeling, reflective, and at odds with ourselves. It's a strange duality of the life of a wildlife photographer - finding joy and adrenaline at the chance of photographing these things, but also finding sadness and empathy with the victim (whether that's the fallen prey or the disappointed predator left hungry again). The rest of the pride were suddenly popping up as if they were part of the action the whole time. Confirming my suspicions that they had taken turns in running this old giraffe ragged all through the night, very few of them had the intention of tucking into their meal immediately. They all needed a rest, a moment of respite. But none more so than this female, who very poignantly sought a pillow for her head and ended up using the neck of her quarry for a moment's shut-eye. Yet, if taken as a snapshot in time, this moment can almost seem as if the predator is in fact taking a moment of silence and respect for her prey...paying thanks for being able to live a bit longer thanks to the sacrifice of this old and weary warrior that fell. 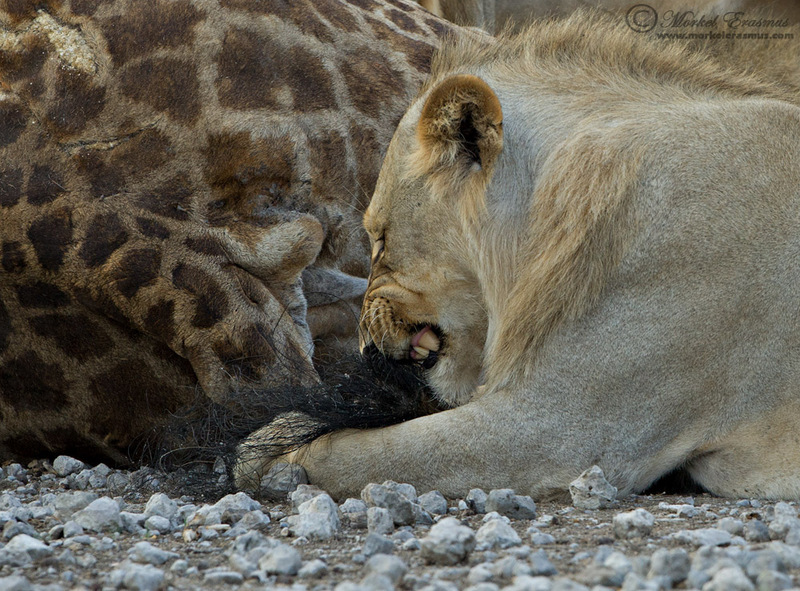 Lions have an interesting relationship with their prey. 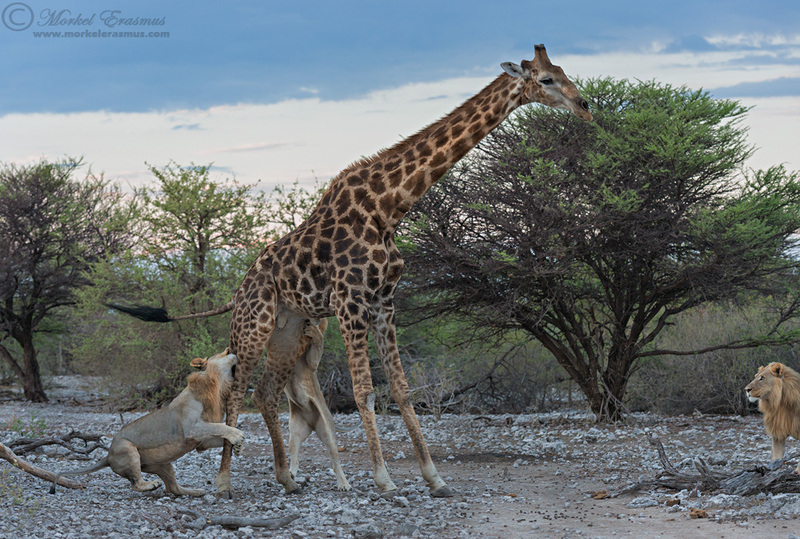 I showed this behaviour in my story about lions in the Kgalagadi taking down a young eland as well (you can read it HERE) - they usually tend to end up playing with their pray a bit before devouring it. By the time they really got stuck into the giraffe, a couple of other vehicles had arrived, some from Namutoni and some from the lodges outside the Namutoni park gate. I decided that I would make way for them, and that I wouldn't get better photos than I already have with the light becoming harsh and the sighting becoming crowded. I had this memorable event all to myself for the most part of the crucial action. 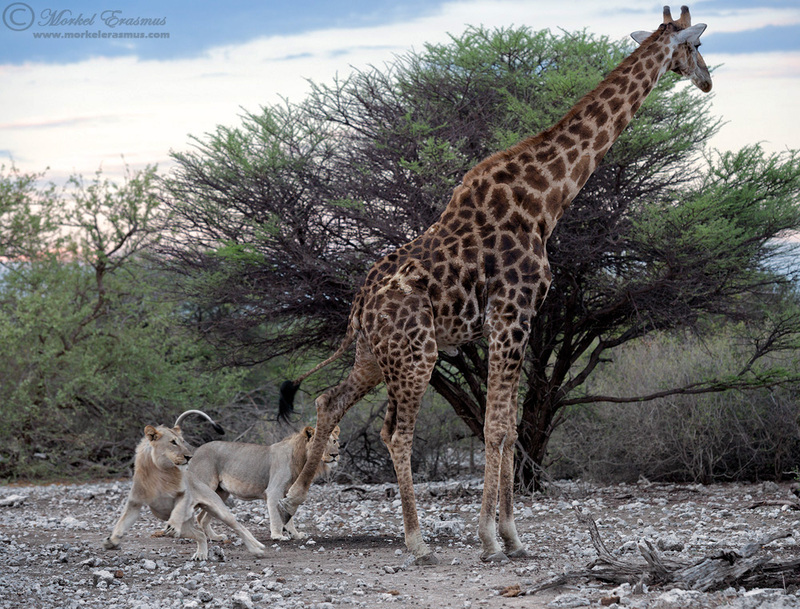 I could have had my wife with me, and a couple we'd met in Etosha on this trip who we'd become friends with - the Cunninghams - who are also keen wildlife photographers. My wife wasn't there because she chose to sleep in, given that our two young kids were also having an unusually drowsy morning I wouldn't blame her, she worked hard in playing with them in the back of the SUV while I drove around and stuck my lenses out the window. Our friends the Cunninhams, well their alarm wasn't set properly, and they literally arrived minutes after the giraffe was down. What's the lesson? 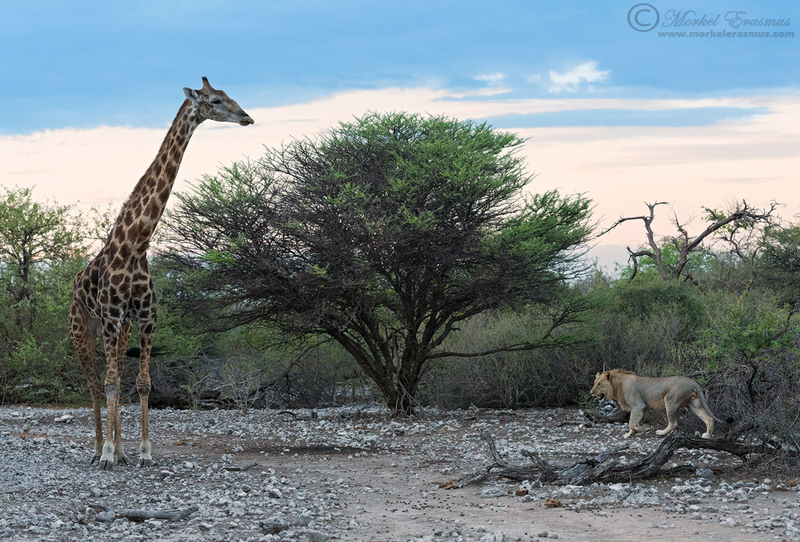 No matter what - get up early and head out of the gate first when on safari! I think I will conclude this story here. 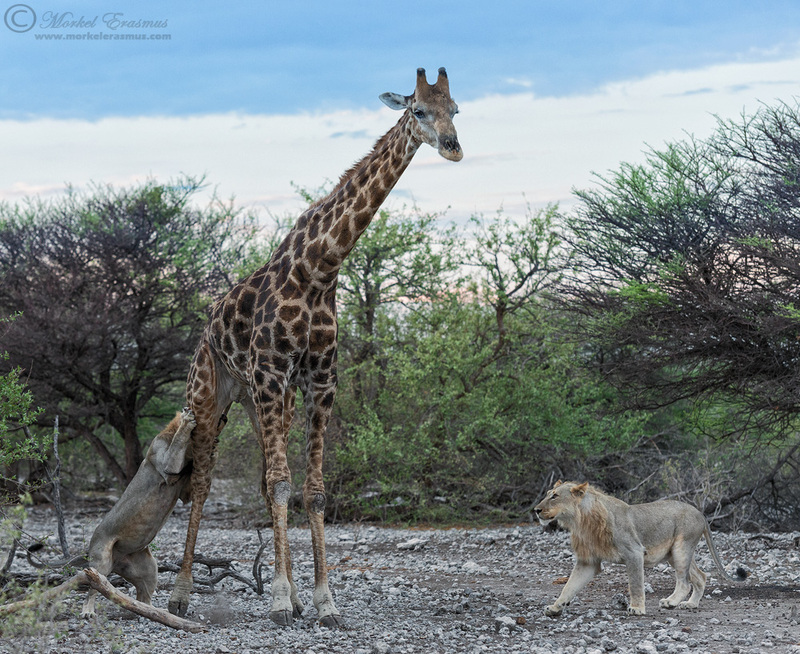 I hope that you could, like me, achieve a deeper understanding and appreciation for the complex relationship between predator and prey, and the delicate balance of the circle of life in the African bush. Viewing this first hand, taking a few photos and reflecting on it now, certainly has had that effect on me. Yes, from a photographic viewpoint I wish that more lions got involved, that they would have jumped on the giraffe's back and neck in dramatic fashion, and that the giraffe would perhaps have shaken them off and landed a kick or two, sending them flying - regardless of the outcome of his life. But I know I witnessed something very rarely seen from start to finish in the bush - and many of my friends who are full-time guides living and working in the bush for years on a day-to-day basis would attest to that. Having these experiences leaves one richer and makes you feel privileged to be a child of Africa...who knows how long we will have the chance of witnessing these struggles with the way things are changing on our continent??? What are your thoughts upon reading and seeing this story in word and photo? Feel free to drop me some of your musings in the comments below, I would love to hear from you. If you missed the first part (The Prelude) then click HERE first. Again - click on the photos and scroll through them to view properly against a dark background. Once the stage was set and the players were assembled, it was time to start the dance. Nevertheless, tired and old as he was, he wasn't going to merely lay down and let his assailants overcome him. He needed to try and scare these two young brigands off before the rest of the pride caught up. They had made turns in running him down all night long, and he had survived this far. This was the last stand, his Gettysburg. The lions started to move around him. 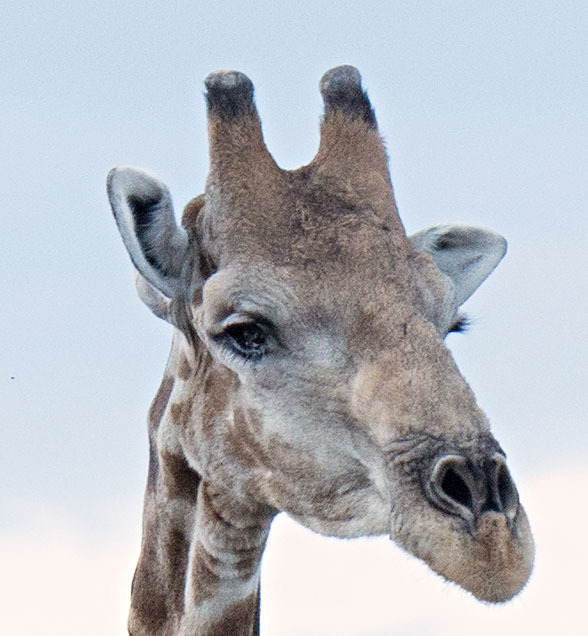 Giraffes have immense hooves and muscular, long, powerful legs with which to fling those hooves at would-be assailants with enough force to deal out a lethal blow. This old guy was unfortunately just too tired to kick with this kind of ferocity - he did lash out a few kicks and swing around to meet his attackers a few times, but his kicks showed his fatigue. I kept cycling between taking a few shots and then removing my eye from the viewfinder to observe what was happening properly. I knew I would probably never see this play out in real-time again, but so often we stay glued to the viewfinder permanently in an epic sighting and never get to use both our eyes and our other senses to experience what was happening and burn it in our memories vividly for years to come. 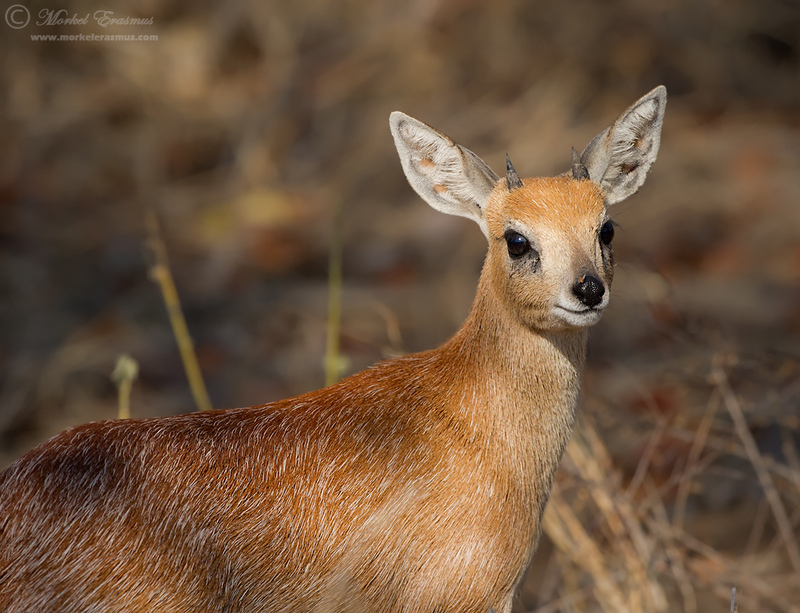 I had arrived with the D800 fitted with the 70-200mm lens and the D3s with the 500mm lens, and even though I wished for more frames-per-second and a bigger buffer I wasn't going to switch lenses in the midst of such a sighting and possibly miss out on the big moments. I was too close for using the 500mm properly - they were only 20 meters from my vehicle! A fully grown male lion can exceed a weight of 250kg. These two weren't that bulky, but I would put them at least at 150kg each. 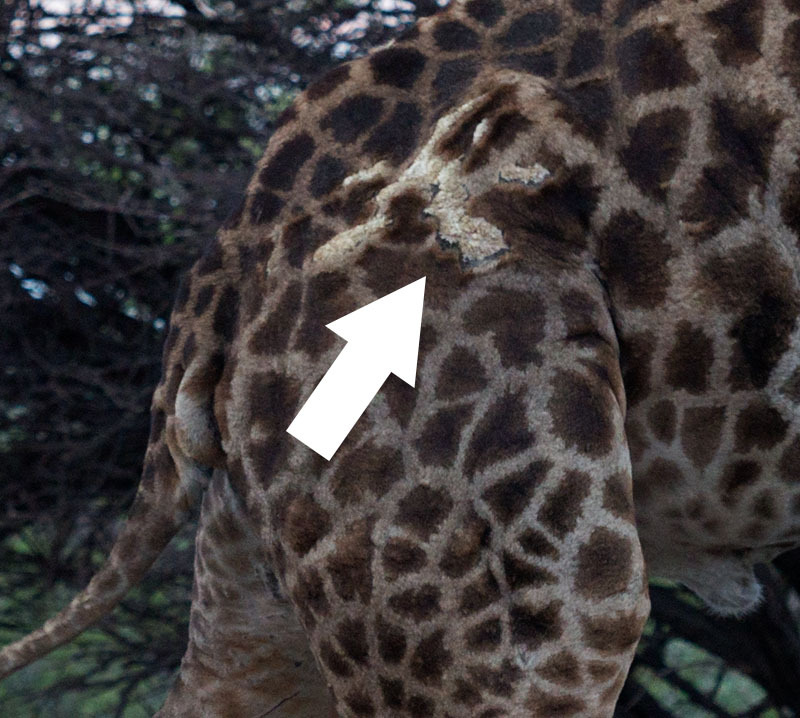 Once both had a hold, the giraffe would need to content with about 300kg of weight dragging down his hind quarters, while trying to maintain his precarious balance. The battle was hanging in the balance now. 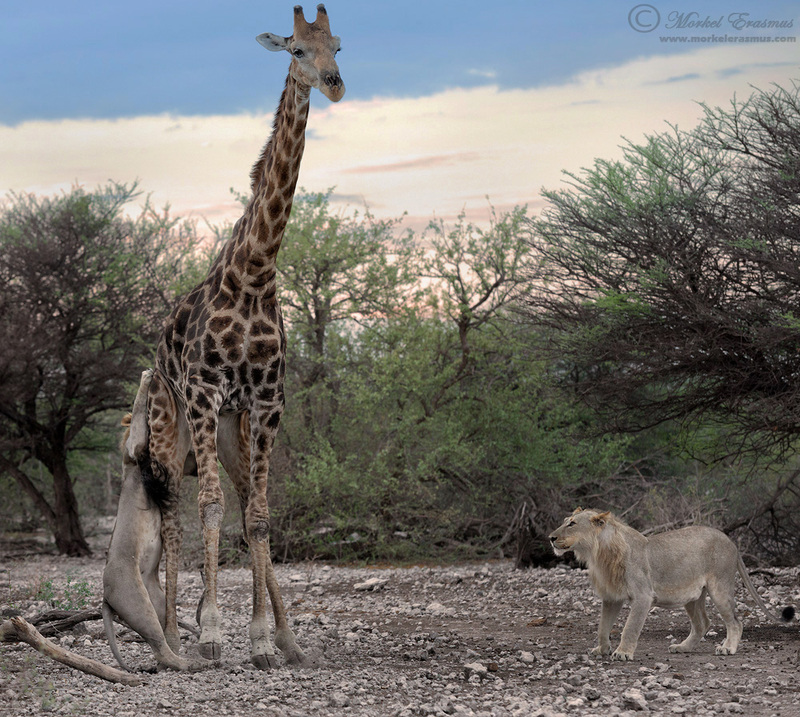 Two strong, confident young males using all of their brute strength to bring down a prey that would feed their pride for days...a large and battle-hardy giraffe who wasn't giving up easily...and a third male lion who was a bit of a wuss. Where were the rest of the lions? How long could the giraffe stand? I know it's not fair of me to leave you on another cliffhanger - but I am kind-of forced to do so. I had promised to post this edition today on my Facebook page, but a massive power disruption in our town that lasted from 8pm last night until this morning as I had to leave for the office forced my hand. I need to process a few more images from my main hard drive in order to fully tell the tale and show you the action as it went down. This will have to wait until our main electricity supply has been restored. Please do stay tuned for the third and final episode of this saga - I should have it live on the weekend or by the latest on Monday morning. Feel free to share these blogs with people who might want to be in on the action! I've been putting off telling this story on my blog...but I feel that it's time. In November 2013 I went on a very long safari-roadtrip with my lovely wife and our 2 young children. 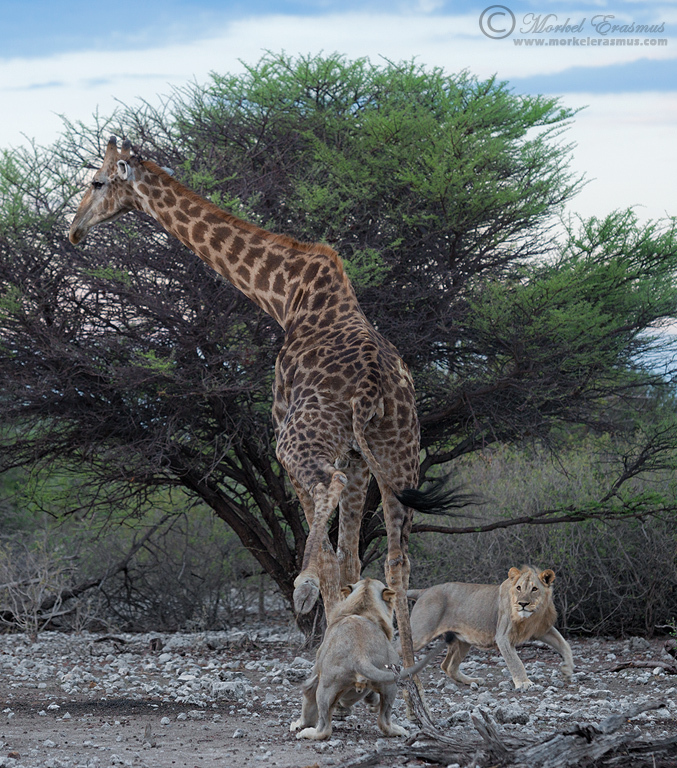 The destinations were to be the Etosha National Park in Namibia and the Kgalagadi Transfrontier Park in South Africa. 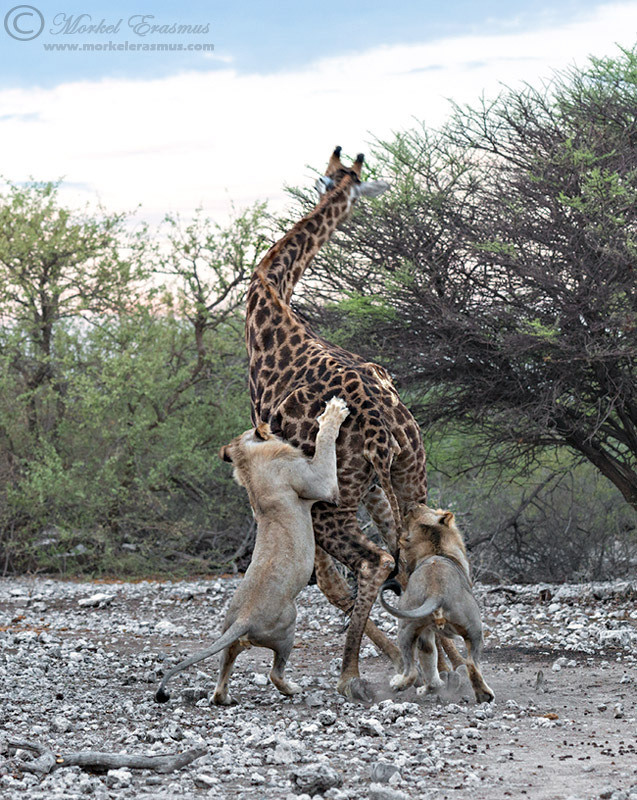 The story I want to tell played out in Etosha. 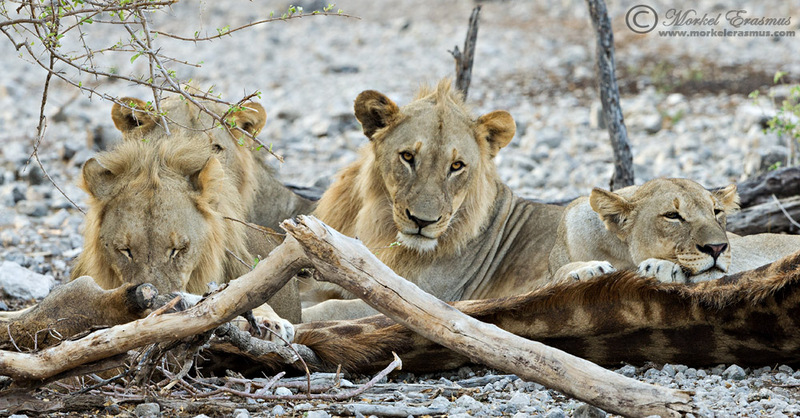 We had come to the last few nights of the Etosha leg of our trip and were based in the Namutoni rest camp in the East of the park. 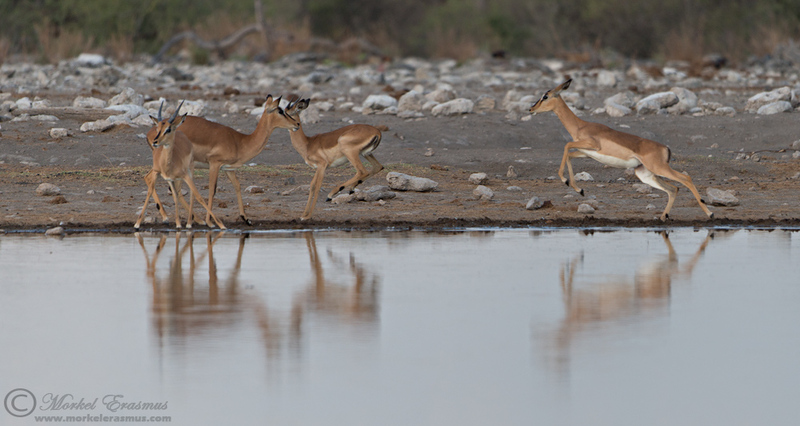 On our first afternoon upon arriving in Namutoni, we took a short drive to scope out the nearby popular waterholes of Chudop and Klein Namutoni. 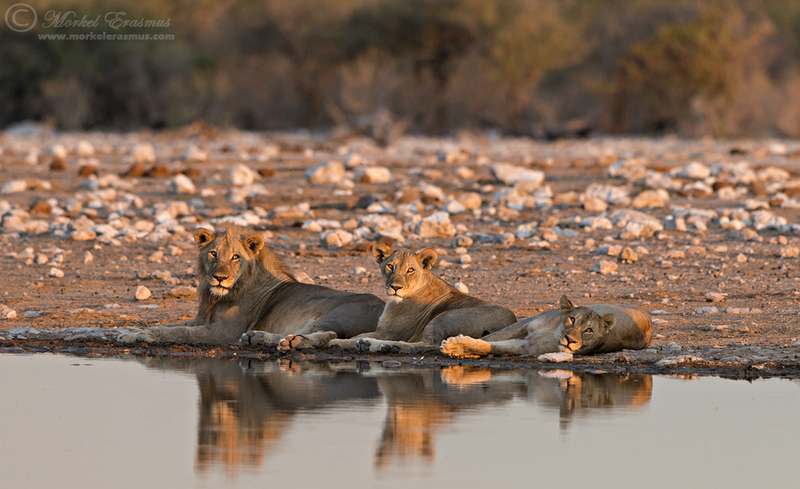 We found the resident lion pride having a drink at the Klein Namutoni waterhole around sunset. Much like on a morning only a year earlier (read THIS post for that story), my wife made the prediction that they would make a kill during the night. Boy, would she be right...but that's what you're reading this story for, so I will carry on. 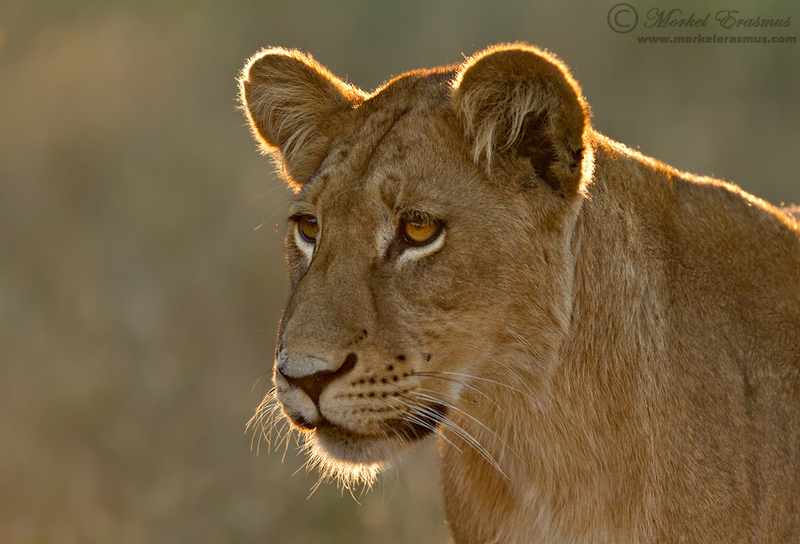 We eventually had to leave the pride where they were, as the camp gate time was beckoning. 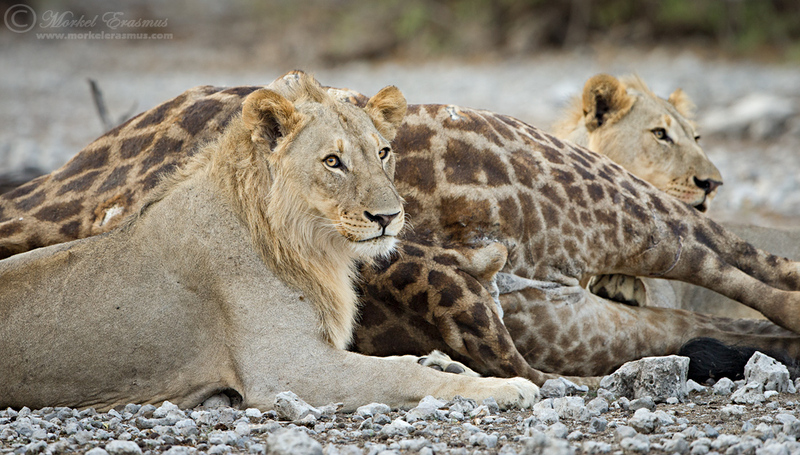 I have a gripe against Etosha gate times in general...as they work on the exact time of sunset and sunrise, and often the best light and sightings happen before sunrise or shortly after sunset. 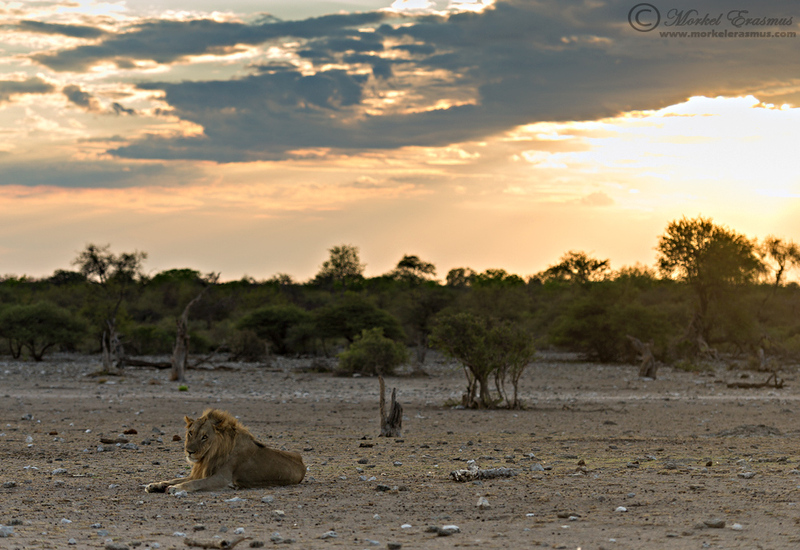 At least in the summer months in the Kalahari and Kruger you get some good leeway either side of sunrise and sunset for those epic moments! The next morning, I was up early and ready to go out. My wife waved me on, as the kids were having a rare morning of still being asleep (usually they were up way before we want to leave for game drive), and she decided to rest a little too (she was minding them every day in the back of the vehicle, after all). I was first out the gate on a cloudy morning, and also the only one from Namutoni heading out for Klein Namutoni that morning, which is about 4km from camp. 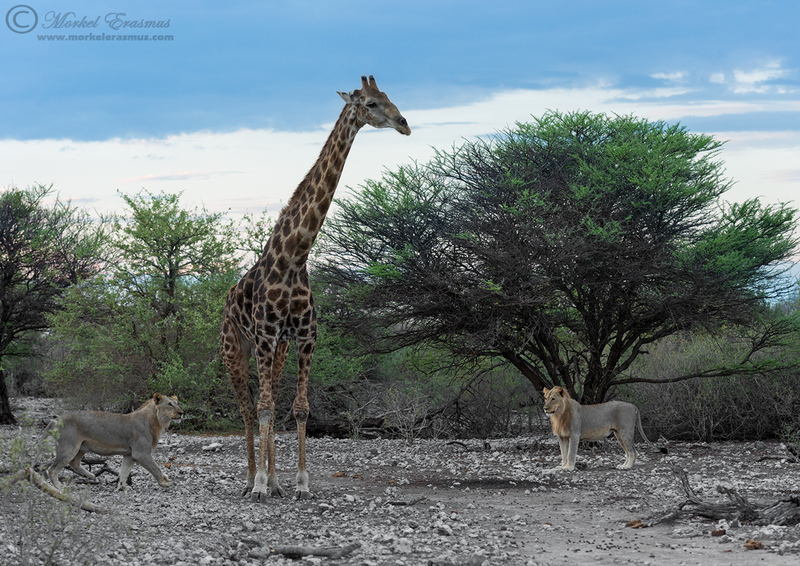 All the other vehicles going out on an early game drive seemed to turn right out of the camp towards the Chudop triangle...not a bad decision given the open setting and density of predators in this area...but it was a bad decision for them on this morning! 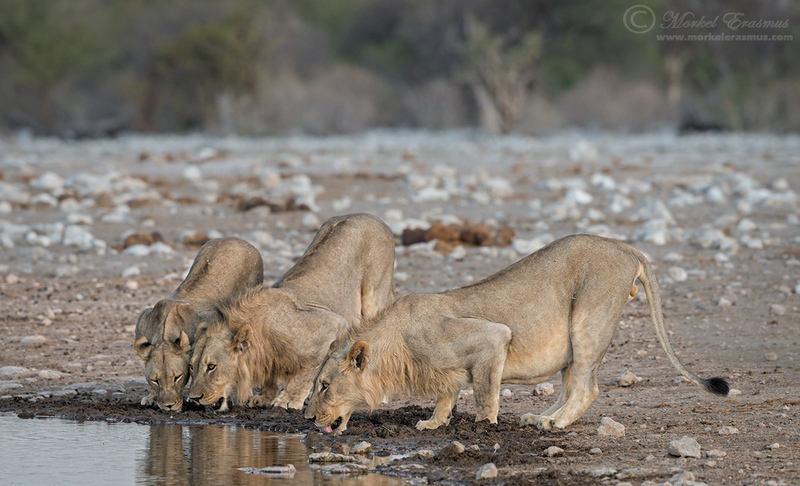 No sooner had I turned into the gravel road leading up to Klein Namutoni, when I spotted 2 of the young males of the pride we sat with the previous evening on a serious trot. 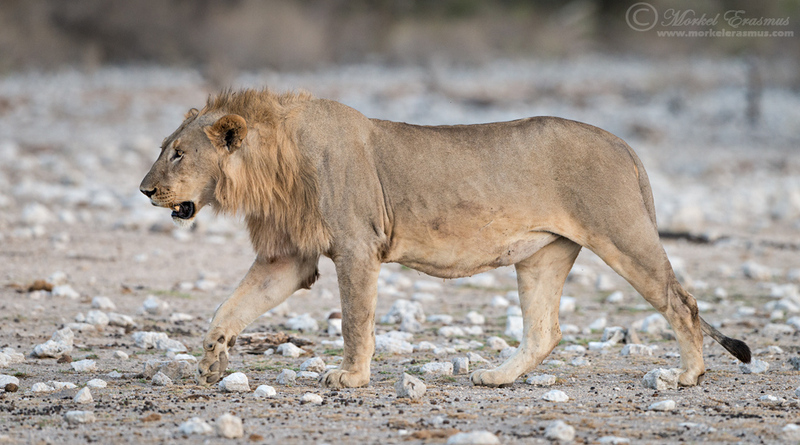 Now, if you've spent any good amount of time observing the behaviour of lions, you'll know that they only ever run or trot like this for 2 main reasons - to get to food or to get to a competitor and fight. 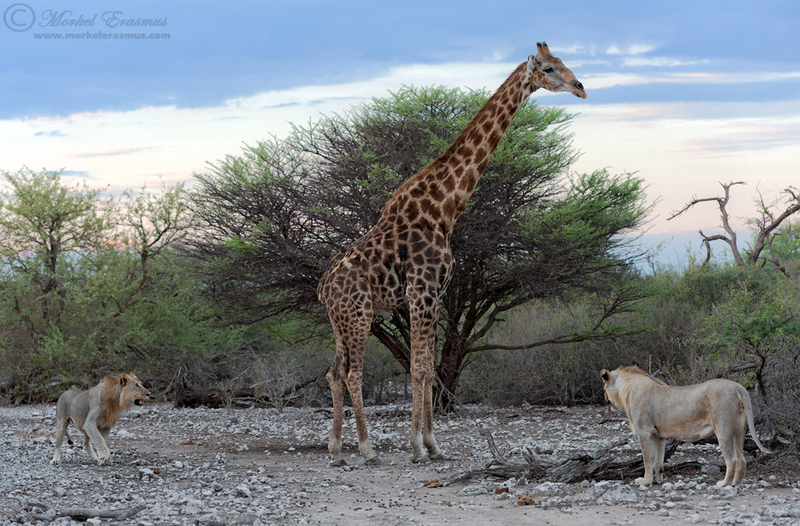 As I came around the next bend I saw the reason for their brisk pace: a large and old Giraffe bull was ambling up the main road, trying to run but obviously dog tired! The pride must have been chasing him for hours during the night, as his hind legs were dragging (but he was as yet not wounded). I kept a reasonable distance and allowed the chase to go its natural way. As always with these kinds of sightings, a part of you hopes the prey will find a way to escape, while another part of you (the avid action photographer) wants it all to go down in a spot where you can take some photos of it! Anyway...soon the Giraffe seemed to realise that he would not escape, and he stopped just off the road (as you drive into Dik-Dik drive past the waterhole) and turned around to face his assailants...the tension was incredible, and my mouth was agape as I realised I would be the only person to witness this taking place only about 20 meters from me!!! Where were the other members of the pride? Are 2 young males enough to take down such a big and muscular quarry? Would one of them be hit by a deadly kick from the giraffe? And of course the photographic questions and challenges! I know that by now you are probably extremely curious and anxious to see what unfolded. You will have to wait for the next edition in this series - I'll post it soon, don't fret! Suffice to say it is one of my most dramatic sightings ever...and I didn't even take that many photos, since I was so spellbound just watching it. Thanks for stopping by. Stay tuned for more soon! Besides the strong focus on wildlife on this blog, I enjoy landscape photography a lot, and I know I should try to get out and do more of it. 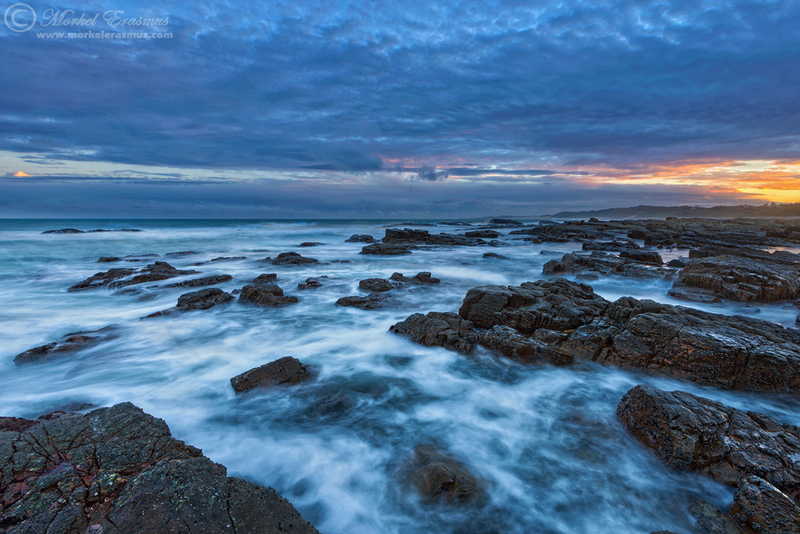 I posted another sunset shot from the rocks around Gonubie, East London about two weeks ago. This is a view in the opposite direction a few minutes later. I'd hoped for more of the red and pink glow on the high clouds that afternoon, but this was about as good as it got. Hey folks! It's that time of the month where I release another desktop wallpaper for you to download for free! I call them WILDpapers, and you can check out last month's download HERE. 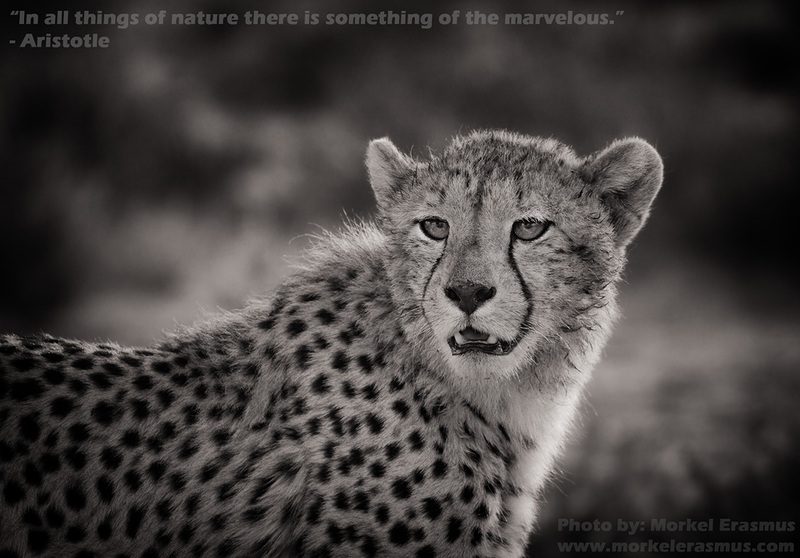 This month's image shows a juvenile cheetah from the Kalahari desert. 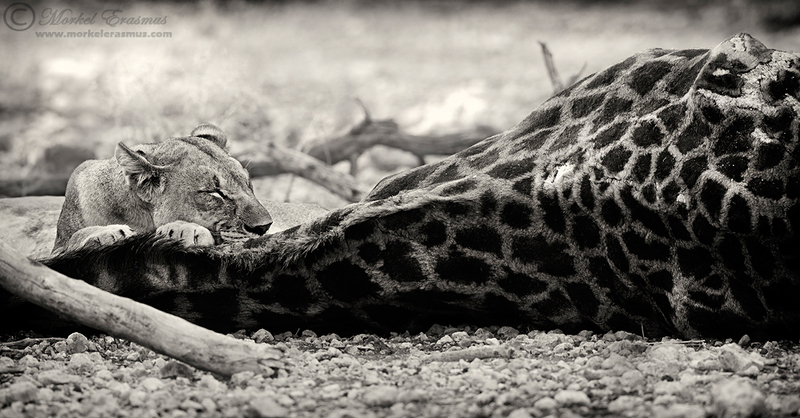 I captured this photo back in June 2010 on a family trip to the Kgalagadi Transfrontier Park, one of the best spots in Southern Africa to view and photograph these speedy felines. This particular photo was taken in the Mountain Zebra National Park of South Africa, a small reserve which has immensely beautiful vistas all around and is a highly underrated safari destination. Situated in the Karoo semi-desert near the town of Cradock, this National Park now sports lions and cheetahs, along with several interesting herbivore species and it's also a hotspot for seeing the elusive Aardwolf! 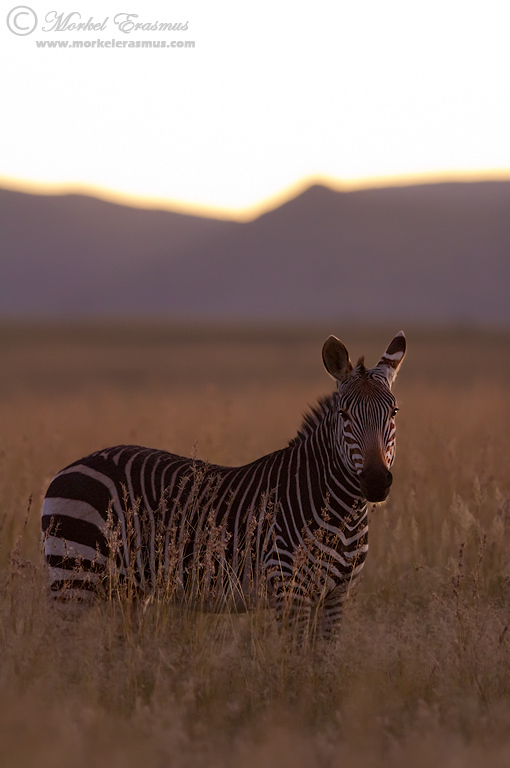 This photo shows the endangered Cape Mountain Zebra (from whom the park takes its name). This species was critically endangered in the early 1900's but was brought back to a sustainable population thanks to the efforts of the South African National Parks, with the establishment of this particular National Park in 1937 no small step in securing their future. You can read more about the park HERE. Tall and proud he stands. Bathed in golden light as the sun sinks to the horizon. 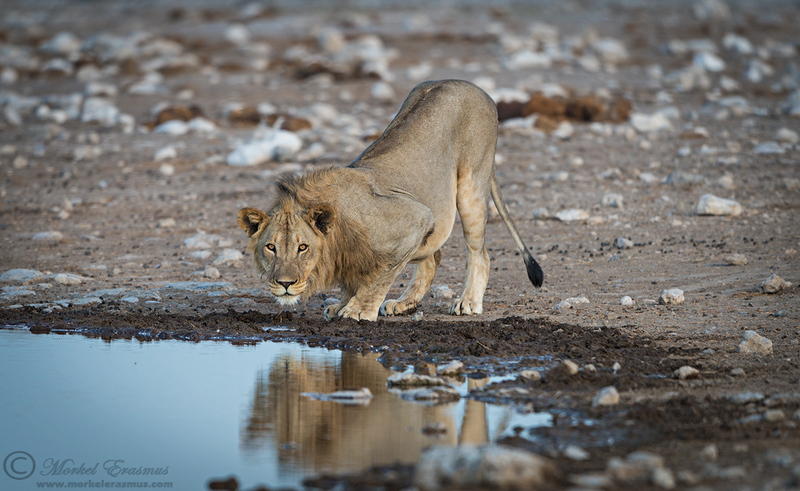 He wants a drink, and he will get it, as he doesn't have enemies at this waterhole. Elephants are special creatures. 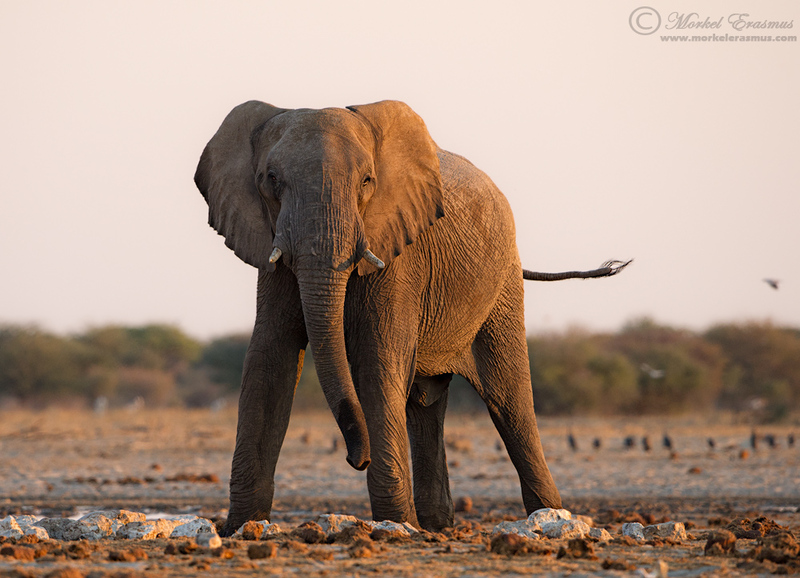 During my time at a research bunker in Namibia last year, I was fascinated by their various rumblings and communication techniques with the other elephants of the area. There is a recent publication on the National Geographic website where you can listen to some of these rumblings and noises, and see a diagram on how it works and what each sound and gesture signals. Check it out HERE. Elephants are, however, under threat from daily poaching all over Africa. They are sometimes poached for meat, but mostly it's all about their ivory tusks. Nations around the world are trying to crack down on ivory smuggling rings and are burning their own confiscated ivory stockpiles, while banning local legal trade in ivory. Let's hope all these efforts will help, because an elephant is illegally killed in Africa every 15 minutes! On 4 October 2014 there will be a "Global march for Elephants and Rhinos" - and you can find more info HERE. I hope you like this image!